I love blog hops & linky parties! I DON'T like having to link up at 1 AM in order to get in before #50... I'm lazy, or laid back, or... Well, you get the point. I want to cuddle a few more minutes with my big bearded hunk of a man. I want to peek in on my sleeping little angels. 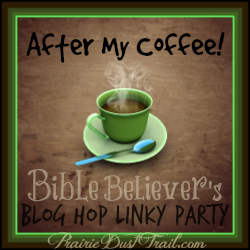 I want to have my breakfast, pour my coffee, ready some scripture and swap laundry before I get online AT ALL, much less wait for Caveman-net to work through the linky-thing-a-ma-jigger... All this to say, I decided to start my own party. For all you ladies who are missing out because you aren't up at 1 AM USA time, here you go! My little rant: When I say Bible Believing, I mean; if your idea of "Family friendly" is 2 dads, or 2 moms in a Sodomite relationship or you are cursing, drinking, or showing off tattoos, I WILL delete you. If you don't like it, too bad. I will not be nice about this. I will not be understanding. I will not even judge you. I believe the Bible and as far as I'm concerned you ARE judged by HIM. That is between you and HIM, keep it away from the families visiting this site. On another note: I do consider guns to be family friendly. That may cause some people to blink, but... Out here guns, knives, slingshots and such-what-not are a necessary part of life. Again, I believe the Bible and even Jesus said to make sure and carry a sword. Snakes are dangerous. Out here, skunks are dangerous too. Having a weapon is important. Also dear meat is very good. We have an over abundance of them and they are a hazard on the roads. If it weren't for responsible hunters, we'd have way too many. Now that I've laid myself out for people to spam me with hate mail & comments... I'd like to invite all of you who made it through my ramblings to join me after your coffee each Thursday. Hopefully this will become a time of blessing and encouragement. I'll give you a few weeks to prepare. Since next week is Thanksgiving, we'll begin December 4th, 2014. We should have lots of fun things to post over the Holiday Season. I look forward to seeing what you share!